Based on a recent scaling law of the water mobility under nanoconfined conditions, we envision novel strategies for precise modulation of water diffusion within membranes made of carbon nanotube arrays (CNAs). In a first approach, the water diffusion coefficient D may be tuned by finely controlling the size distribution of the pore size. In the second approach, D can be varied at will by means of externally induced electrostatic fields. Starting from the latter strategy, switchable molecular sieves are proposed, where membranes are properly designed with sieving and permeation features that can be dynamically activated/deactivated. Areas where a precise control of water transport properties is beneficial range from energy and environmental engineering up to nanomedicine. Carbon nanotubes (CNTs) and other carbon-based particles are used as fillers in a large variety of composite materials because of their superior thermal, mechanical, and electrical properties [1–4]. Patterns of vertically aligned CNTs (also known as carbon nanotube arrays (CNAs)) can be immersed in polymer or ceramic matrices for obtaining nanoporous materials, which are characterized by precisely controlled pore width and density. CNAs are typically produced by either physical  or chemical [6, 7] vapor deposition on catalyst or substrate patterns predesigned by nanolithography processes; however, alternative production approaches - such as self-assembly on biological templates  or DNA-mediated  - have also been recently proposed. Well-ordered nanoporous membranes are obtained by CNAs incorporation across polymer or ceramic matrices by spin-coating  or conformal encapsulation , respectively. Plasma-etching treatments can then open up CNT tips, whereas plasma-oxidation processes functionalize channel entrances for gatekeeping purpose . CNA-based materials may find biomedical or engineering applications such as nanostructured filters, separators, detectors, or vectors with diagnostic or therapeutic function. Concerning biomedical applications, CNAs are ideal building blocks for designing artificial biomembranes capable of mimicking functionalities of Nature’s channels (e.g., aquaporins), as recently investigated both experimentally  and numerically . These nanoporous materials are also used in devices for controlled transdermal drug delivery  as well as for DNA/RNA amplification , sensing , or translocation [17–19]. Engineering applications of CNAs mainly exploit their ability to selectively trap nanoimpurities (e.g., wastewater treatments [20, 21]) or ions (e.g., seawater desalination [22–24]) dispersed in water, as well as their gas separation  and catalysis properties , especially for fuel cell technology. Further peculiar properties of CNTs entail an even broader applicability of CNAs in engineering: super-hydrophobicity for self-cleaning surfaces [27, 28], phonon dragging by fluid flow for energy harvesting or nanosensing [29, 30], and optical properties for electrical coupling in photonic  or photothermal devices . Although mechanical, thermal, and electrical properties of CNTs have been deeply investigated [1, 32], the physical understanding of diffusion properties of fluids through their pores is still incomplete [33, 34]. Transport diffusivity D T of water inside narrow CNTs is order of magnitude faster than bulk one, as demonstrated by both computational calculations and experiments [12, 13, 35–37]. Such flow rate enhancement is due to slip flow conditions of water within CNT nanopores, which is governed by the liquid structure and collective molecular motion induced by both mechanical and electrical smoothness of CNT walls and their confinement effect on water. Predicting the water self-diffusivity (i.e., mobility) D under nanoconfined conditions is also of interest in several fields . Computational studies agree with a progressive reduction of water mobility by decreasing the nanotube diameter [33, 39]: a physical interpretation - based on supercooling properties of nanoconfined water - and quantitative prediction of the phenomenon have been recently formulated by Chiavazzo and collegues , whereas novel and improved experimental techniques may further support these studies in the near future . 1 D = 1 Ð i + 1 Ð ii . D T = Γ Ð i . When CNTs with subnanometer diameters are considered, single-file diffusion regime occurs, which induces a sudden increase of the drag experienced by water molecules in passing each other (i.e., 1/Ð ii →∞). Hence, due to Equation 1, D→∞ and D assumes near zero values, which means that water is totally nanoconfined within the CNT even if D T may still attain quite large values . In this particular regime, self- and transport diffusivities are correlated by means of the thermodynamic factor. Equation 3 (also known as Darken’s equation) was first suggested by Richard Barrer [47, 48], and it has been demonstrated both theoretically and experimentally to be a reliable correlation between self- and transport diffusion under the aforementioned conditions [34, 49]. For these reasons, the a priori prediction of self-diffusion coefficient of water within CNTs allows a more rational design of the CNA-based technologies relying on transport properties of water (e.g., mass separators, catalytic converters, selective filters, molecular sensors, nanosized chemical or biological reactors). Here, classical molecular dynamics (MD) simulations and the recent modeling of water transport in nanoconfined conditions  are synergistically used for a systematic prediction of self-diffusivity of water in CNAs, according to different pore width distributions and electrostatic fields. Results pave the way to a precise design of transport properties of water in CNA-based devices. Water mobility is progressively reduced while approaching solid surfaces at the nanoscale because of the confinement effect induced on water molecules by attractive nonbonded interactions at the solid-liquid interface . The reduction in water mobility implies a smaller self-diffusion coefficient D, ranging from bulk values to almost null ones according to the nanoconfinement conditions, depending on the geometric, chemical, and physical factors of a given configuration. Peculiar thermodynamic properties of supercooled water have a key role in interpreting the reduction of D in nanoconfined environments . Following the approach in reference , if isothermal conditions are considered, the intensity of water nanoconfinement scales with a dimensionless parameter θ = V in V w , being Vin the volume where a solid surface exerts a non-negligible influence on the water dynamics and V w the overall volume occupied by water in the considered configuration. Vin can be estimated by introducing the characteristic length of nanoconfinement δ, which is defined as the distance where thermal agitation of water is still significantly influenced by van der Waals Uvdw and Coulomb Uc solid-liquid interactions, namely where kinetic energy of water k B T equals solid-liquid effective potential Ueff=Uvdw+Uc. Note that water molecules beyond the characteristic length δ progressively tend to behave as bulk ones because they escape the potential well generated by the solid wall, which is subject to a power decrease along the direction normal to the surface. θ ̄ = ∑ i = 1 N 4 ϕ e , i δ i - 4 δ i 2 ∑ i = 1 N ϕ e , i 2 . CNT geometry. The geometric quantities of CNT, needed for evaluating the scaling parameter θ in Equation 4, are schematically shown. The quantity δ can be computed by a well-defined algorithm  once nanoconfined geometry, Connolly surface of solid  and solid-water nonbonded interaction potentials are given. Connolly surfaces are generated from MD trajectories, which are produced by the following procedure: (i) CNT structures are solvated in triclinic boxes of water (SPC/E model ) with different volumes and periodic boundary conditions along xyz directions, (ii) the system made by nanotube and water is energy minimized and equilibrated, (iii) a molecular dynamics simulation of the whole setup is then performed up to 200 ps in canonical ensemble, by applying a temperature coupling on the system (time constant = 0.1 ns, T= 300 K) . Two types of atomic interactions are taken into account in the simulations: (i) bonded interactions, modeled as harmonic stretching and angle potentials and (ii) nonbonded interactions, accounting for Van der Waals and electrostatic forces, modeled as a 12-6 Lennard-Jones potential. Further details on the employed force field are reported elsewhere [38, 52, 56, 57]. Simulations are carried out with a leapfrog algorithm (1 fs time step) by means of GROMACS software. Nanotubes with different size (ϕ,L) or partial charge (qC,i) on carbon atoms are simulated, in order to assess geometric and electrostatic effects on δ.
which is valid for 4 δ ϕ e ≤ 1 . Inspection of Equation 8 reveals that strategies aiming at tailoring the self-diffusivity of water within CNTs can be based on the design of either the tube diameter or the confinement potential (i.e., CNT-water interactions, by introducing defects, functionalizations, or external electrostatic fields). Implications of Equation 8 on CNA-based technologies are analyzed by means of MD simulations, which are here used for estimating δ of CNTs in the considered setups. In particular, effects of CNT geometry or electrostatic field on D are explored, in order to suggest experimental guidelines to precisely control water self-diffusion in CNAs under static conditions. First, different width distributions of CNA pores are considered. Characteristic length of nanoconfinement δ of CNTs are then calculated with different ϕ (i.e., from 0.8 to 14.0 nm) and L (i.e., from 5 to 50 nm) by MD simulations. 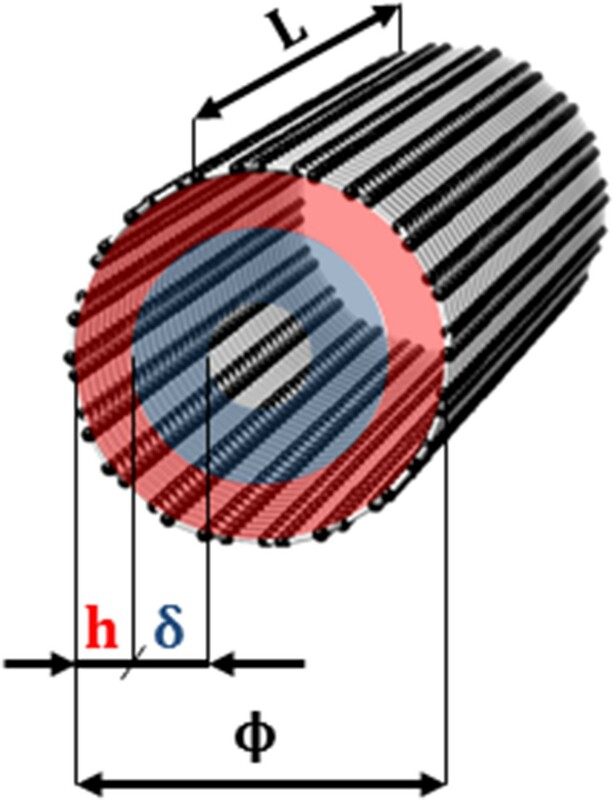 Results show that nanotube geometry has no significant effect on the characteristic length of nanoconfinement, being approximately around δ=0.37 nm. Current experimental techniques allow to produce arrays of nanotubes with size, pattern, and areal density precisely defined, by simply adjusting production procedure or parameters [6, 60, 61]. While CNT length usually spans from tens to thousands of nanometers, CNT diameter can reach few nanometers width or even less [11, 62]. However, CNAs include pores with a Gaussian distribution of diameters ϕ, where significant standard deviations σ of the average value μ can be encountered because of the lack in repeatability and quality of current production techniques [11, 13, 62]. In Figure 2a, three Gaussian distributions of ϕ are considered (being L=100 nm fixed), according to different (μ,σ) values, namely: 2.5 nm, 0.5 nm; 5.0 nm, 0.5 nm; and 2.5 nm, 1.5 nm. Note that ϕ= 0.8 nm is the narrowest CNT experimentally observable, whereas a distribution interval ϕ∈[μ-2σ,μ+2σ] is taken into account. According to Equations 5 and 7 and the characteristic length of nanoconfinement δ from MD runs, overall D decreases as the average ϕ is reduced: D θ ̄ is 0.99×10-9 m2 s-1 for μ= 2.5 nm (Figure 2b) whereas it increases to 1.78×10-9 m2 s-1 for μ= 5.0 nm (Figure 2c). Moreover, standard deviation has also a significant role in tailoring local and average D of water within CNAs. For example, while in CNT distribution represented in Figures 2b,d the mode (0.89×10-9 m2 s-1) and the minimum (near 0 m2 s-1) D values are the same, the maximum D shifts from 1.40×10-9 to 2.47×10-9 m2 s-1, respectively. Moreover, a σ increase from 0.5 to 1.5 nm leads a 40% rise in D θ ̄ to 1.41×10-9 m2 s-1. Self-diffusivity of water in CNAs with Gaussian distribution of pore width. (a) Three Gaussian distributions of CNT diameters are considered, with different mean values μ or standard deviations σ. 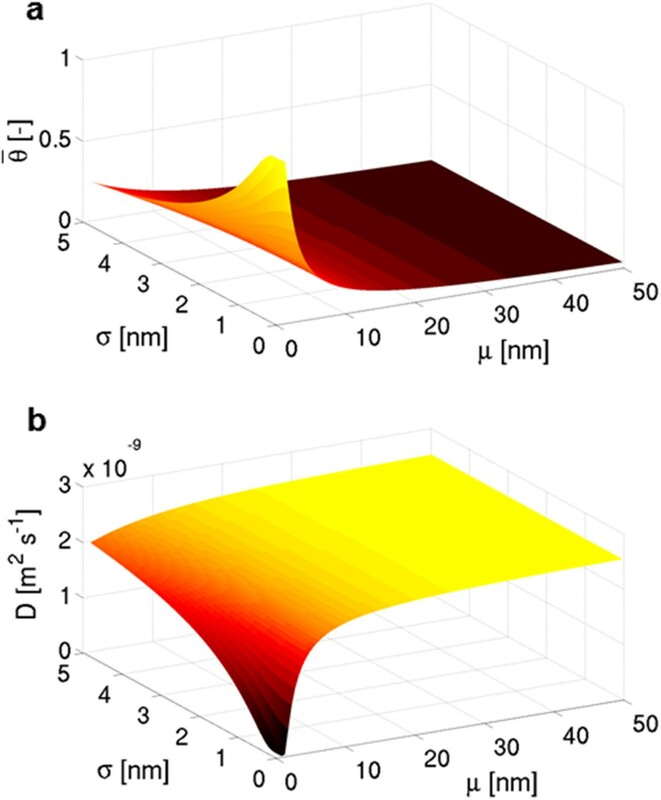 (b) Self-diffusion coefficient of water nanoconfined within CNTs distributed with Gaussian frequencies f N and μ= 2.5 nm, σ= 0.5 nm; (c) μ= 5.0 nm, σ= 0.5 nm; (d) μ= 2.5 nm, σ= 1.5 nm. A more systematic analysis of the influence of μ and σ on θ ̄ (thus on the overall D) is then performed. Results in Figure 3 show a synergistic contribution of μ and σ in the reduction of D. In fact, both large σ values and large μ values imply D≈DB (regardless of other quantities); whereas if both average and standard deviation of CNT diameter distributions show lower values, an exponential reduction in D is experienced. In other words, the average D of water within CNAs can be tuned not only by controlling the average pore size (i.e., μ) but also by the accuracy (i.e. σ) of the CNA production, which strongly affects the overall CNA transport properties. Note that a significant reduction (e.g., more than 25%) in overall D from bulk values is only achievable when CNT diameter distributions are characterized by μ< 7.0 nm and σ< 3.0 nm. 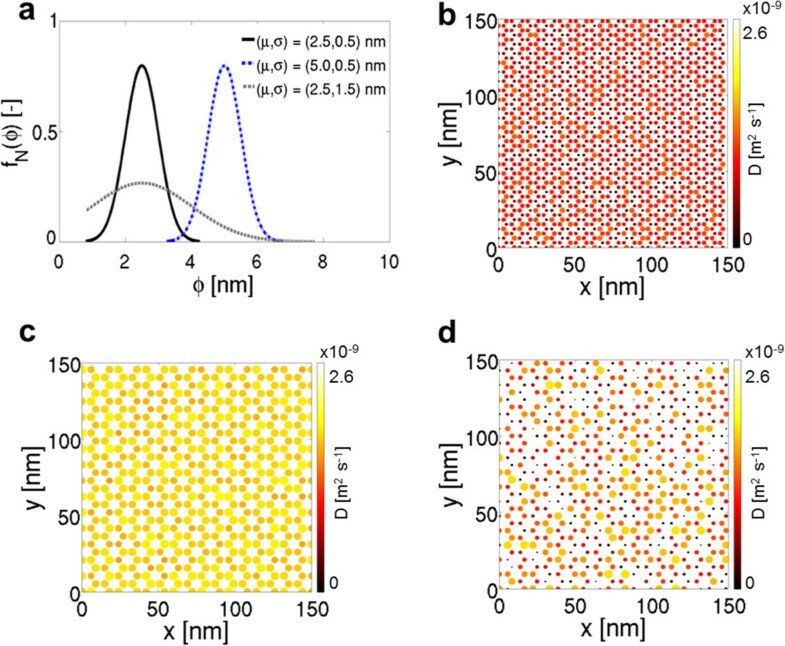 Moreover, Figure 3 highlights that an average bulk behavior of water within CNA-based composite materials is expected for ϕ> 10 nm, independently from the size distribution; however, as already noticed in Figure 2d, highly dispersed size distributions (i.e., high σ) imply low local D, which may be of interest for size-dependent molecular sieving applications. Effect of pore diameter distribution on water nanoconfinement in CNA. (a) CNAs with Gaussian distribution of pore width are systematically analyzed (μ∈ [0.8, 50]; σ∈ [0, 5]), and both the average scaling parameter θ ̄ (i.e., the mean magnitude of water nanoconfinement in a CNA section) and (b) the overall self-diffusivity of entrapped water D θ ̄ (Equation 7) are evaluated. Second, δ and D are investigated when an electrostatic field is applied to CNA. If CNA-based composites are characterized by strong dielectric properties, the inner surface of CNTs tends to be uniformly polarized if an electrostatic field is switched on [63–65]. Therefore, MD force field is adequately modified for taking into account the charges introduced on carbon atoms (qC,i) by applying an electrostatic potential to the system. A CNT with ϕ= 1.4 nm and L= 12 nm is chosen as a representative case, and δ is estimated with different qC,i. Considering a fixed CNA section (μ= 2 nm; σ= 0.5 nm), Figure 4 depicts how D distribution changes when qC,i= 0 eV (δ= 0.37 nm), 0.5 eV (δ= 0.50 nm), or 1.0 eV (δ= 0.70 nm), respectively. More specifically, D θ ̄ = 0.70 × 1 0 - 9 m 2 s - 1 in a neutral CNA (Figure 4a), while it drops to 0.36×10-9 m2 s-1 with qC,i= 0.5 eV (Figure 4b) and to 0.10×10-9 m2 s-1 with qC,i= 1.0 eV (Figure 4c). It is also worth mentioning that water is totally confined in 15% of CNA pores when no electrostatic field is applied (Figure 4d), whereas the percentage rises to 32% and 67% when qC,i= 0.5 (Figure 4e) or 1.0 eV (Figure 4f), respectively. Water nanoconfinement increase by electrostatic field application to CNA. (a) Local D of nanoconfined water are plotted as predicted by Equations 4 and 6, while considering different Coulomb charges on carbon atoms for simulating the application of an electrostatic field to CNA, namely qC,i= 0 eV, (b) qC,i= 0.5 eV or (c) qC,i= 1.0 eV. (d) The considered CNA section presents pore diameters distributed with Gaussian probability (μ= 2.0 nm; σ= 0.5 nm). When no electrostatic field is applied, δ ( V 0 ) = 0.37 nm and 15% of CNA pores contain totally confined water (i.e., θ= 1) with near zero mobility; whereas (e) with qC,i= 0.5 eV, δ ( V 1 ) = 0.50 nm and the percentage rises to 32% or (f) with qC,i= 1.0 eV, δ ( V 2 ) = 0.70 nm and the percentage further increases to 67%. h≈ 0.34 nm is the minimum approaching distance between carbon atoms and water molecules. The voltage corresponding to an electrical charge qC,i can be estimated by the classical relation: V = Q C , where Q = ∑ i q C , i is the overall electrostatic charge on CNTs and C is the electrical capacitance. Experimental works show that the specific capacitance c = C m of pure single-walled CNTs is about 40 F g-1; whereas it increases to 320 F g-1 or even more when CNTs are immersed in electrically conducting polymers, giving rise to ideal materials for supercapacitors. Hence, considering the previous upper and lower bounds for c, the voltage is found to vary within the following ranges: V≈ 140 to 1,195 V for qC,i= 0.5 eV and V≈ 280 to 2390 V for qC,i= 1 eV, which can be easily achieved by common electrostatic devices. Few experimental techniques are currently available for validating these predicted reductions in water self-diffusion, namely by direct (e.g., diffusion nuclear magnetic resonance (NMR) , microimaging ) or indirect measurements of water dynamics under static conditions. In particular, indirect methods allow both to deduce D by measuring other physical properties of CNAs and to investigate effects of water confinement on electromagnetic, thermal, or optical water properties. For example, enhancement of r1,2 relaxivities of contrast agents for magnetic resonance imaging (MRI) is inversely proportional to D[68, 69]; boiling temperature and pressure of water inside CNTs is drastically dependent on their diameter ; optical Kerr effect measurements are used to study modified characteristics and structures of nanoconfined water . Molecular dynamics simulations and theoretical arguments suggest that self-diffusion of water D within CNAs can be finely tuned, from bulk to totally confined behaviors. As from Equation 8, two parameters control D in CNTs, namely δ characteristic length of nanoconfinement and ϕ nanotube diameter. 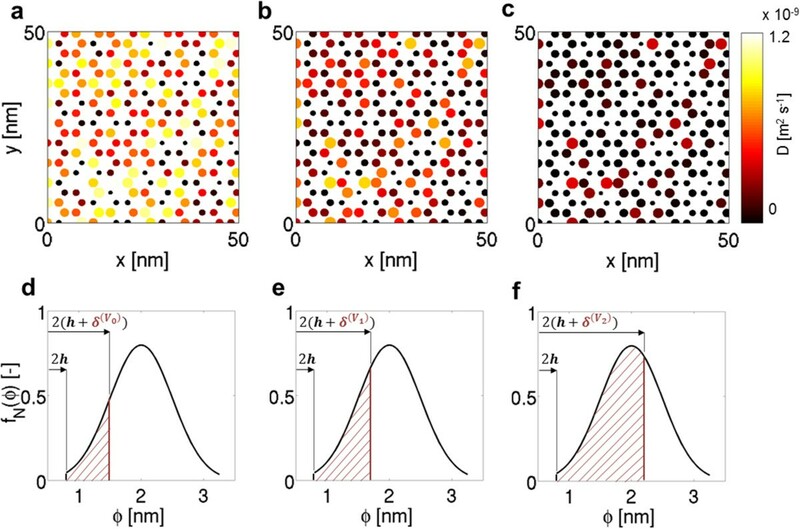 Different ϕ distributions in CNAs can be experimentally achieved, according to a specific pattern, surface density, or width of the pores, in order to rationally design spatial D distribution of water. Nevertheless, while ϕ allows an a priori tuning of D (i.e., D distribution in CNAs cannot be modified once the sample is produced), the a posteriori control of D is feasible thanks to instantaneous modifications of δ by on/off switching or tuning of an external electrostatic field. A broad range of CNT-based technologies may find benefits by the precise control of static transport properties of confined water molecules, in particular in biomedical or engineering fields. For example, MRI contrast agents performances are tuned by D of nearby water molecules; whereas the delivery rate of solvated drugs encapsulated within transdermal porous materials could be also controlled by D of surrounding water, both in constant release applications (e.g., long-term administration of therapeutics) and in dynamic ones (e.g., drug release in response to sudden pathological conditions). Moreover, the value of D in water is a key parameter in molecular sensors, sieves, and biological/chemical reaction chambers. As an example, in Figure 5, we report the functional scheme of a possible molecular sieve based on a posteriori control (by electrostatic field) of D within a CNA-based composite. CNA should be adequately engineered with a ϕ size distribution so that only nanoparticles/molecules with approximately D<ϕ e -2δ diameters could pass through its nanopores (red and green spheres in Figure 5a). Note that chemical functionalization of both nanoparticles and CNTs may also influence the permeability of molecular sieve. Once an electrostatic field is applied to the CNA thus δ increases to δ(V), sieving properties could suddenly change, due to reduced mobility of water within CNAs. For example, bigger nanoparticles/molecules could be trapped in the porous matrix (red spheres in Figure 5b), which could become partially or totally impermeable to nanoparticles/molecules with approximately D>ϕ e -2δ(V) diameters. In fact, if CNA membranes are designed with well-defined pore sizes such that Barrer’s approximation holds and self- and transport diffusivities can be correlated by Darken’s equation (Equation 3), the increase in low-mobility water volume within CNTs may in turn affect the dynamic transport properties of CNA. Schematics of a tunable/switchable molecular sieve based on CNA. (a) CNA-based composites may be used for sieving purposes, because their tunable pore width distribution induces different mass transport properties within pores. Thanks to Equations 4 and 7, CNA-based sieves may be designed for being selectively permeable to different nanoparticles or molecules, according to their size and chemical functionalization. (b) Sieving properties may also be influenced by the application of electrostatic field on CNA, which enhances δ of CNTs thus slowing down water dynamics and overall mass transport properties of the sieve. Hence, permeation features of CNAs may be precisely tuned and dynamically switched. In this letter, self-diffusion of water within carbon nanotube arrays is studied, both numerically and theoretically. D is found to scale with CNT diameter ϕ and characteristic length of nanoconfinement δ, which is related to the solid-liquid nonbonded interaction potential at the interface. A strategy for an a priori modulation of D in CNA-based applications is suggested, by controlling size distribution of the pore widths. Moreover, δ of CNTs can be increased by introducing electrostatic field thus allowing also an a posteriori control of D in CNAs. A large variety of fields may benefit from a precise control of transport properties of water entrapped within CNA-based technologies, such as nanomedicine and environmental or energy engineering. Authors would like to acknowledge the THERMALSKIN project for the revolutionary surface coatings by carbon nanotubes for high heat transfer efficiency (FIRB 2010, grant number RBFR10VZUG) and the NANO-BRIDGE project for the heat and mass transport in NANO-structures by molecular dynamics, systematic model reduction, and non-equilibrium thermodynamics (PRIN 2012, grant number 2012LHPSJC). MF acknowledges travel support from the Scuola Interpolitecnica di Dottorato - SCUDO. The authors thank the CINECA (Iscra C project DISCALIN) and the Politecnico di Torino’s DAUIN high-performance computing initiative for the availability of high-performance computing resources and support. The authors are grateful to Dr. Tom Humplik of the Massachusetts Institute of Technology for the valuable discussions. MF carried out the molecular dynamics simulations, proposed the idea of switchable molecular sieve, and drafted the manuscript. EC and PA conceived the idea and supervised the study. All authors refined and approved the final manuscript.